Erma Martin Yost graduated from James Madison University in Harrisonburg, VA, with an M.A. in painting and ceramics. 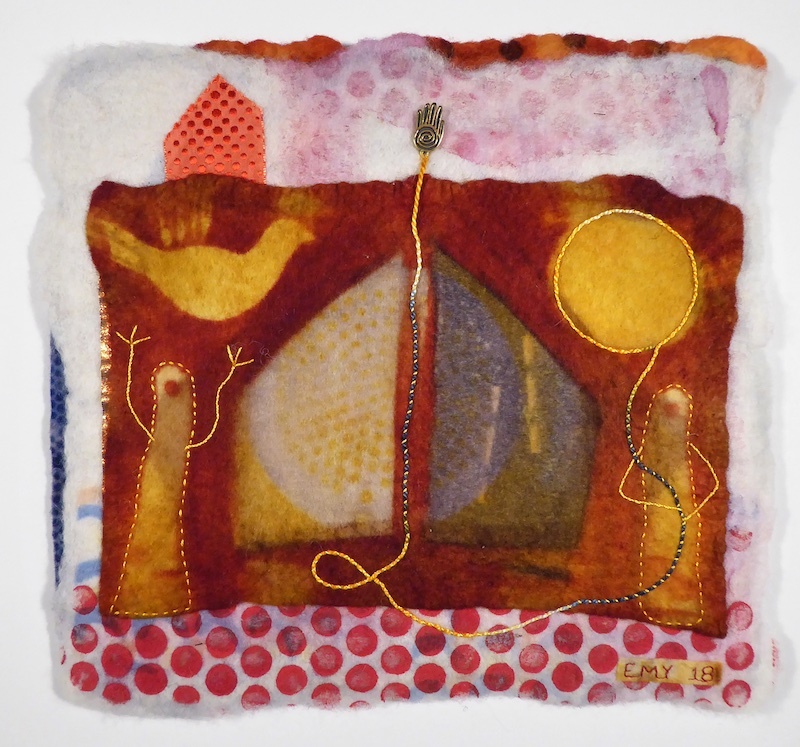 In 2018 Yost had a solo show at Visions Art Museum: Contemporary Quilts + Textiles, San Diego, CA. Her work is in numerous public collections including the Museum of Art and Design in New York City and Bristol-Myers Squibb in Princeton, NJ, the New Jersey State Museum, the Jersey City Museum, the Newark Museum, the Hunterdon Museum, the Morris Museum, and the State Museum of Pennsylvania have all exhibited her work. Yost received fellowships from New Jersey Council on the Arts in 1991 and 1999. She has had more than 28 solo exhibitions and is featured in more than 21 books. Noho M55 Gallery in New York City represents her. For more examples of Yost’s work visit ermamartinyost.com. Observing nature is a constant in my daily routine, and I’m always seeking out new or unexpected colors, sights or sounds. Unconsciously, those unending discoveries and cycles have become an inspiration for my work. My medium is felt, the most ancient of textile forms–long predating both spinning and weaving. I create the felt from un-spun wool, then dye and shape it into the foundation of my work. In my Seasons series, I’ve also incorporated fabric-printing experiments that I made over the past several decades, then set-aside for future use. Now, returning full circle, those earlier textiles have become an integral component of my current work. Drawn to the tactile qualities of all textiles, I am particularly fascinated by “needle crafts” practiced by women through the ages. Increasingly I find examples of vintage tatting and embroidery about to be casually cast aside at flea markets and garage sales. Honoring the legacy of domestic arts and crafts by anonymous women, I sometimes incorporate these “finds” into my work. In Seasons my aim is to express a response to the cycles in nature: seasonal cycles, plant cycles, sun and moon cycles, even life cycles. Assembling bits and pieces from my inner and outer worlds, I try to evoke my own personal world containing a sense of place, solitude and contemplation.